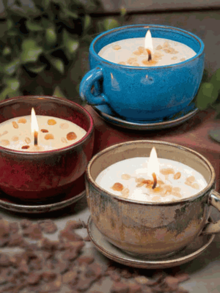 Please note our Stoneware Coffee Cup Collection are assorted colors and a specific color for each fragrance can not be guaranteed. If you have a specific color you'd like, please call 888-272-2773 for assistance with which fragrances are available in each color. Filled with 5 oz. of American Soybean WaxTM. Measures 2.25"h x 3.5"w with a 30+ hour burn time. Refilling information: One container of Candle Refill Wax will refill this container four times. This container requires one #60 wicks to refill. Filled with 13 oz. of American Soybean WaxTM. Measures 3.5"h x 6.25"w with a 50+ hour burn time. Refilling information: One container of Candle Refill Wax will refill this container two times. This container requires two #60 wicks to refill.